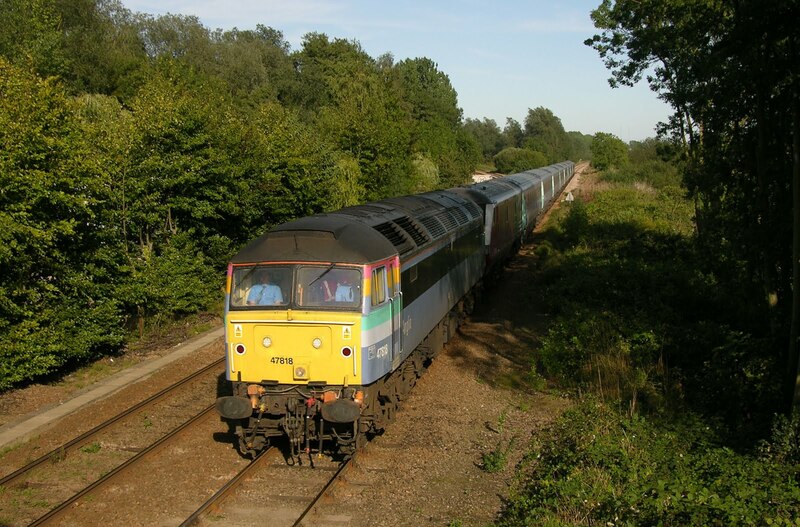 Trains Today: Summer Saturdays in Anglia- 10 years ago. Last weeks post covered the current loco hauled operations on the Wherry lines out of Norwich to Great Yarmouth and Lowestoft- currently featuring top and tailed diesel locomotives on a short rake of coaches, but I also mentioned the long association of class 47's with these lines. While looking back through my photo archive I discovered that exactly 10 years ago I had found myself in Anglia for my annual trip to Great Yarmouth to sample the 47 hauled summer trains. The trips comprised of two workings in each direction (plus associated empty moves) where a class 47 hauled the Norwich-Yarmouth portion of through intercity services to and from London Liverpool Street on summer Saturdays. The trains would run as normal to Norwich where the class 47 would back onto the train and then run non-stop to Great Yarmouth. On arrival at the seaside town the locomotive would run round before hauling the set back to Norwich from where it would form the next London departure with it's electric loco. As can be seen from the pictures the class 90, or 86 in previous years, also came along to the seaside for the ride. One of the very last survivors on Anglia, 9701 is seen at Ipswich. In 2016 locomotives for the train were provided by Cotswold Rail, and the current franchise holder was National Express, branding the operation 'One'. By this time almost all Mk2's had been phased out in favor of Mk3 stock with just a handful of Mk2 DBSO's remaining in traffic. 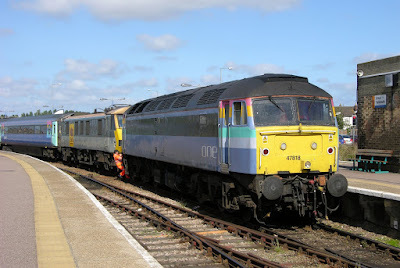 The final year of class 47 hauled intercity trains to Great Yarmouth was 2014.